Serge Ibaka blocks a shot by Indiana's David West. Thunder center Enes Kanter shoots over the hands of a Pacer defender. Kanter finished with 15 points. Newly-acquired forward Kyle Singler dribbles past an Indiana defender during Tuesday's game. Dion Waiters makes a move past a Pacer defender Tuesday night. Waiters finished with 14 points and two rebounds. Russell Westbrook notched his third triple-double of the season with 20 points, 10 assists and 11 rebounds. Westbrook scored 20 points, grabbed 11 rebounds and dished out 10 assists as the Thunder notched its seventh win in a row. Oklahoma City won its third straight game without Kevin Durant, who had a screw replaced on his surgically repaired right foot on Sunday. He is set to be reevaluated in a week. Even without Durant, the Thunder was on fire Tuesday as Serge Ibaka scored 23 points and had 10 rebounds while newcomer Enes Kanter had 15 points, which is his average since being acquired from the Utah Jazz in a three-team trade last week. Westbrook’s triple-double was his third of the season and 11th of his career, despite not playing in the fourth quarter. As usual, Thunder head coach Scott Brooks praised his All-Star point guard. 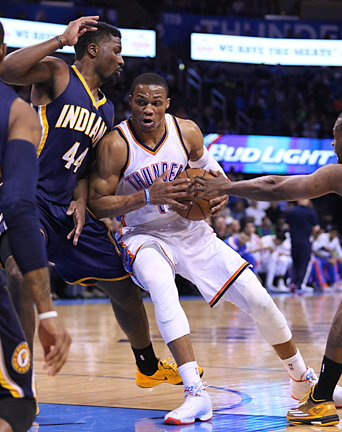 Oklahoma City led by as many as 15 in the first half before the Pacers cut the advantage to six before halftime. Indiana cut the Thunder’s lead to three in the third quarter before Westbrook and Dion Waiters combined for eight points to push the Oklahoma City lead to 80-68. Consecutive threes by D.J. Augustin, Anthony Morrow and Waiters pushed the lead to 89-69 to seal the win. The Thunder, which is 9-1 in February, closed within 2 ½ games of the San Antonio Spurs for the No. 7 spot in the Western Conference. Oklahoma City (32-25) begins a West Coast swing with games at Phoenix on Feb. 26, at Portland on Feb. 27 and at the Los Angeles Lakers on March 1.